Two of the nation’s largest healthcare groups are suing the Trump administration over a final rule to institute site-neutral payments for clinic visits, saying the policy would hurt patients. Last month, the Centers for Medicare & Medicaid Services (CMS) finalized the 2019 Outpatient Prospective Payment System (OPPS) rule (PDF), which will gradually institute site-neutral payments in the Medicare program over the next two years. Agency officials said site-neutral payments for clinic visits will lower out-of-pocket costs for beneficiaries and save the program as much as $380 million in 2019. In a complaint filed in the U.S. District Court for the District of Columbia, the American Hospital Association (AHA) and the Association of American Medical Colleges (AAMC) said the rule would lead to access problems as hospitals cut services, hurting vulnerable patients. The associations claimed the administration is overstepping its legal bounds and were joined in the legal action by Olympic Medical Center in Port Angeles, Washington; Mercy Health in Muskegon, Michigan; and York Hospital in York, Maine. “These cuts directly undercut the clear intent of Congress to protect hospital outpatient departments because of the real and crucial differences between them and other sites of care,” said Rick Pollack, president and CEO of the AHA, in a statement. AHA said it was planning legal action shortly after the rule was finalized. Physician groups, including the American Association of Family Physicians (AAFP) and the American College of Physicians (ACP) as well as groups like the Cancer Oncology Alliance, have supported site-neutral payments for some time. AAFP has said site-neutral payments can also help community clinics stay open at a time many have had to close due to vertical integration, consequently advancing patient choice and reducing costs. But hospital groups oppose the rule, which also expands a CMS policy limiting how much drug companies can charge hospitals for their products in the 340B program. Most recently, AHA had sued CMS over the 340B program changes before HHS bumped up the implementation date last month for changes that would set price ceilings and add civil monetary penalties for manufacturers—two changes the AHA supported. Six senators, including three Republicans, are asking GOP leadership to block a Trump administration rule that slashes funding for a federal drug discount program. The program, called 340B, requires drug companies give discounts to health-care organizations that serve high volumes of low-income patients. But a new rule from the Centers for Medicare and Medicaid Services, which takes effect Jan. 1, cuts Medicare payments to hospitals enrolled in the program by $1.6 billion. The senators are urging the cuts to be reversed in the year-end spending deal. “We recognize there are opportunities to strengthen the program through targeted clarifications and improvements to ensure it continues to fulfill its purpose with integrity and efficiency and are willing to work with stakeholders to find productive solutions in this space,” the senators wrote in a letter to Senate Majority Leader Mitch McConnell (R-Ky.) and Minority Leader Charles Schumer (D-N.Y.). Sens. John Thune (R-S.D. ), Rob Portman (R-Ohio), Shelley Moore Capito (R-W.Va.), Bill Nelson (D-Fla.), Tammy Baldwin (D-Wis.) and Debbie Stabenow(D-Mich.) all signed the letter. The request follows a letter 51 senators sent to CMS earlier this year expressing concerns over the changes. Hospital groups argue the rule would jeopardize the ability to serve low-income patients. The American Hospital Association, America’s Essential Hospitals and the Association of American Medical Colleges are suing the administration to block the rule. CMS has argued that the changes will increase access to care and lower out-of-pocket drug costs for Medicare beneficiaries. More are starting biotech companies or joining consulting or financial firms instead of practicing—all while the U.S. suffers a shortage of doctors. Like Alkaitis, more people are coming out of medical school and choosing not to practice medicine. Instead, they’re going into business—starting biotech and medical device companies, working at private equity firms, or doing consulting. In a 2016 survey of more than 17,000 med school grads by the Physicians Foundation and health-care recruitment firm Merritt Hawkins, 13.5 percent said they planned to seek a nonclinical job within three years. That’s up from 9.9 percent in 2012. A separate Merritt Hawkins survey asks final-year residents: “If you were to begin your education again, would you study medicine or would you select another field?” In 2015, 25 percent answered “another field,” up from 8 percent in 2006. Among the reasons they cited: a lack of free time, educational debt, and the hassle of dealing with insurance companies and other third-party payers. The trend is worrying, as the U.S. already suffers a shortage of doctors, especially in rural areas. “If you have a large number of people out training to see patients and taking care of people in our communities, then all of a sudden deciding not to, that’s a concern,” says Atul Grover, executive vice president of the Association of American Medical Colleges. The AAMC projects a nationwide deficit of as many as 100,000 doctors by 2030. Some consulting companies are also stepping up hiring of doctors. 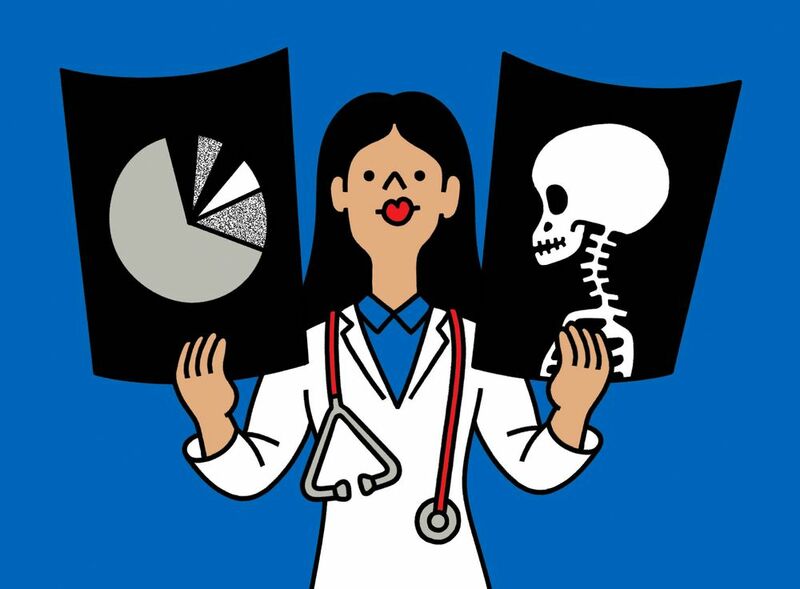 Steffi Langner, a spokeswoman for McKinsey, says her firm is actively recruiting doctors because the analytical skills necessary to be an M.D. are similar to the problem-solving skills a consultant needs. Dr. Jon Bloom trained as an anesthesiologist and practiced for three months, then enrolled at Massachusetts Institute of Technology’s Sloan School of Management. He says he was inspired by other doctors he knew who were inventors and entrepreneurs. One reason more are choosing that path is that investors are willing to fund them. Figures compiled by the National Venture Capital Associationshow that investment in medical-related startups climbed from $9.4 billion in 2007 to $11.9 billion in 2016. Bloom is co-founder and chief executive officer of Podimetrics, a startup in Somerville, Mass., that has developed a mat device that predicts and prevents diabetic foot ulcers. He says that even though his invention is now on the market after receiving approval from the U.S. Food and Drug Administration in 2015, he’s still living the startup life. “I definitely don’t make nearly as much as what a doctor makes. That wasn’t really important to me,” he says. “My friends who graduated residency many years ago, they have multiple cars, fabulous houses. They did OK. I still occasionally eat ramen noodles,” he chuckles. BOTTOM LINE – A U.S. deficit of doctors may worsen as a growing minority of medical school grads are choosing other professions.